Entrepreneurship student and CityStarters winner, Wendi Lai, reflects on lessons learned at The Startup Way book launch. My name is Wendi, a Singaporean student undertaking the MSc in Entrepreneurship at Cass Business School. I was honoured to be invited to Eric Ries' book launch after winning CityStarters Weekend this year. I couldn't be more excited to share about what I learned during the event, when I had the privilege of meeting Eric Ries, the author of The Lean Startup, the scientific methodology that aims to shorten product development time, through the build-measure-learn feedback loop, iterative product releases and validated learning. The world-renowned approach is taught in almost all business schools and practised by established corporations such as General Electric and Zappos to early-stage startups. 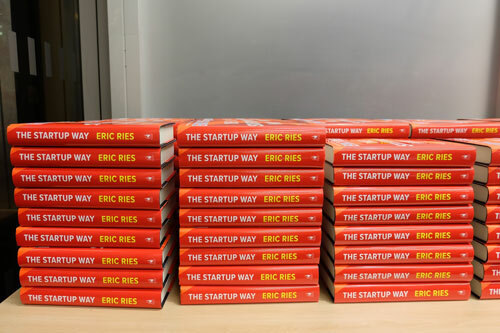 Ries’ new book, The Startup Way, talks about how entrepreneurial principles can be applied in all types of companies to drive innovation, grow revenues and transform internal processes to capitalise on opportunities. During the book launch, he shared about the importance of accountability in defining a company’s culture and possessing a clear vision whilst making pivots for a product or service. Contrary to what most businesses believe, Ries propagates that process actually drives culture and not the other way around. “Bad” people and culture are not considered inputs of a company. Instead, they are outcomes of the system currently in place. In fact, it is the accountability systems within companies that work against cross functional and collaboration nature of entrepreneurial methods. To enable employees to learn and pivot continuously, it is paramount for companies to reward those who develop smart minimum viable products (MVPs) and encourage early failures. It is only after successful modifications to the accountability systems that a culture of entrepreneurship can be cultivated. Ries also mentioned that a clear vision is essential during the product development phase, especially when pivots are constantly made. A pivot is a change in strategy without a change in vision. To build the right product, it requires systematic and relentless testing of the vision to find out what works and what does not. When an entrepreneur does discover a new and more successful way to achieve his vision, he needs to be proficient and timely in seizing the opportunity. If you hate big companies so much, why do you want to create one? It is no doubt that Ries has played a significant role in my academic and entrepreneurial journey thus far. He taught me that entrepreneurship is ultimately about company-building to maximise creativity and productivity potential of all members in the organisation.